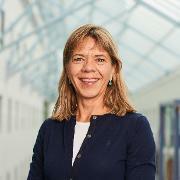 Sameline Grimsgaard (dr. med, MPH) er professor i epidemiologi og leder for Tromsøundersøkelsen. Hun har arbeidet med klinisk forskning og befolkningsundersøkelser, samt forskningsledelse. Nåværende forskningsaktivitet er knyttet til risikofaktorer for hjerte-karsykdom, overvekt/fedme og fysisk aktivitet med utgangspunkt i Tromsøundersøkelsen. Sameline Grimsgaard har 20 % bistilling som forskningsrådgiver ved Universitetssykehuset Nord-Norge (UNN). Aars, Nils Abel; Jacobsen, Bjarne K.; Furberg, Anne-Sofie; Grimsgaard, Sameline. Self‐reported physical activity during leisure time was favourably associated with body composition in Norwegian adolescents. Acta Paediatrica 2018. ISSN 0803-5253.s 1 - 6.s doi: 10.1111/apa.14660. Borud, Einar Kristian; Grimsgaard, Sameline; White, Adrian Roger. Menopausal problems and acupuncture. Autonomic Neuroscience: Basic & Clinical 2010; Volum 157 (1-2). ISSN 1566-0702.s 57 - 62.s doi: 10.1016/j.autneu.2010.04.004. Borud, Einar Kristian; Alræk, Terje; White, Adrian Roger; Grimsgaard, Sameline. The Acupuncture on Hot Flashes Among Menopausal Women study: observational follow-up results at 6 and 12 months. (data) Menopause 2010; Volum 17 (2). ISSN 1072-3714.s 262 - 268.s doi: 10.1097/gme.0b013e3181c07275. Waaseth, Marit; Nakling, Marie; Bakken, Kjersti; Grimsgaard, Sameline. Use of dietary supplements and medication among postmenopausal women with vasomotor symptoms. Climacteric 2010; Volum 13 (6). ISSN 1369-7137.s 585 - 593.s doi: 10.3109/13697130903480714. Borud, Einar Kristian; Alræk, Terje; White, Adrian; Grimsgaard, Sameline. The acupuncture treatment for postmenopausal hot flushes (Acuflash) study: traditional Chinese medicine diagnoses and acupuncture points used, and their relation to the treatment response. Acupuncture in Medicine 2009; Volum 27 (3). ISSN 0964-5284.s 101 - 108.s doi: 10.1136/aim.2009.000612. Borud, Einar Kristian; Martinussen, Monica; Eggen, Anne Elise; Grimsgaard, Sameline. The Women's Health Questionnaire (WHQ): A psychometric evaluation of the 36-item Norwegian version. Scandinavian Journal of Psychology 2009; Volum 50 (2). ISSN 0036-5564.s 183 - 189.s doi: 10.1111/j.1467-9450.2008.00701.x. Waaseth, Marit; Eggen, Anne Elise; Grimsgaard, sameline. Natural remedies in Scandinavia - authorization and sales. Pharmacy World & Science 2007; Volum 29 (3). ISSN 0928-1231.s 137 - 146.s doi: 10.1007/s11096-006-9033-7. Grimsgaard, Sameline; Bønaa, Kaare Harald; Bjerve, Kristian S. Fatty acid chain length and degree of unsaturation are inversely associated with serum triacylglycerol concentrations. Lipids 2000; Volum 35. ISSN 0024-4201.s 1185 - 1193. Hansen, John-Bjarne; Grimsgaard, Sameline; Nordøy, Arne; Bønaa, Kaare Harald. Dietary supplementation with highly purified eicosapentaenoic acid and docosahexaenoic acid does not influence PAI-1 activity. Thrombosis Research 2000; Volum 98. ISSN 0049-3848.s 123 - 132. Grimsgaard, Sameline; Bønaa, KH; Jacobsen, B. K.; Bjerve, Kristian S. Plasma saturated and linoleic fattty acids are independently associated with blood pressure. Hypertension 1999; Volum 34. ISSN 0194-911X.s 478 - 483. Delghandi, Madjid; Thangarajah, R; Nilsen, M; Grimsgaard, Sameline; Bønaa, Kaare Harald; Tonstad, Serena; Jørgensen, Leif. DNA polymorphisms of the apolipoprotein B gene (XbaI, EcoRI, and MspIRFLPs) in Norwegians at risk of coronary artery disease and healthy controls. Acta Cardiologica 1999; Volum 54. ISSN 0001-5385.s 215 - 225. Hansen, John-Bjarne; Grimsgaard, Sameline; Nilsen, Hugo; Nordøy, Arne; Bønaa, Kaare Harald. Effects of highly purified eicosapentaenoic acid and docosahexaenoic acid on fatty acid absorption, incorporation into serum phospholipids and postprandial triglyceridemia. Lipids 1998; Volum 33. ISSN 0024-4201.s 131 - 138. Grimsgaard, Sameline; Bønaa, Kaare Harald; Hansen, John-Bjarne; Myhre, Eivind S. P.. Effects of highly purified eicosapentaenoic acid and docosahexaenoic acid on hemodynamics in humans. American Journal of Clinical Nutrition 1998; Volum 68. ISSN 0002-9165.s 52 - 59. Grimsgaard, Sameline; Bønaa, Kaare Harald; Hansen, John-Bjarne; Nordøy, Arne. Highly purified eicosapentaenoic acid and docosahexaenoic acid in humans have similar triacylglycerol lowering effect but divergent effects on plasma fatty acids. American Journal of Clinical Nutrition 1997; Volum 66. ISSN 0002-9165.s 649 - 659. Halvorsen, Dag Seeger; Hansen, John-Bjarne; Grimsgaard, Sameline; Bønaa, Kaare Harald; Kierulf, Peter; Nordøy, Arne. The effect of highly purified Eicosapentaenoic and docosahexaenoic acids on monocyte phagocytosis in man. Lipids 1997; Volum 32. ISSN 0024-4201.s 935 - 942. Grimsgaard, Sameline; Husebø, Stein. Langtkommen cancer i abdomen. Behandling av følgetilstander. Tidsskrift for Den norske legeforening 1990; Volum 110. ISSN 0029-2001.s 587 - 589. Lundblad, Marie Wasmuth; Jacobsen, Bjarne K.; Grimsgaard, Sameline; Andersen, Lene Frost; Carlsen, Monica Hauger; Hopstock, Laila Arnesdatter. Energy and macronutrient intake and associations with body mass index and fat mass index: The seventh Tromsø Study 2015-16. Norsk Epidemiologi, Supplement 2018. ISSN 0803-4206. Johansson, Jonas; Leon, David; Johansen, Heidi; Grimsgaard, Sameline; Hopstock, Laila Arnesdatter. In-progress validation study of body composition measures assessed by Dual-Energy X-ray Absorptiometry (DXA) and Bioimpedance Analysis (BiA). Heart-to-Heart Symposia 2018-10-25 - 2018-10-26 2018. Henriksen, André; Horsch, Alexander; Grimsgaard, Sameline; Hopstock, Laila Arnesdatter. Validation of the Actiheart, ActiGraph, and ActiWave Cardio for measuring physical activity and heart rate in the Tromsø 7 study and the Know Your Heart study. Heart to Heart symposium 2018-10-25 - 2018-10-26 2018. Grimsgaard, Sameline. Tromsøundersøkelsen - Folkehelsebarometer og gullgruve for medisinsk forskning. Faglige møte med Lipidklinikken OuS 2018-01-22 - 2018-01-22 2018. Grimsgaard, Sameline; Johansen, Heidi; Nielsen, Christopher Sivert. Tromsøundersøkelsens barn - strategisk satsing ved UiT. Møte med Helse og Omsorgsdepartementet 2018-01-11 - 2018-01-11 2018. Grimsgaard, Sameline; Opdalshei, Ole Alexander. Nordic Trial Alliance - Nordic cooperation in clinical Research/presentation. EU - Joint meeting to discuss issues on clinical trials 2018-05-30 - 2018-05-30 2018. Grimsgaard, Sameline. Befolkningsundersøkelser i nord - strategisk sating ved UiT. Regionalt samarbeidsråd - program for folkehelsearbeid i kommunene 2018-01-10 - 2018-01-10 2018. Grimsgaard, Sameline. The Tromsø study. The Tromsø study for Universite Laval (Canada) 2018-01-18 - 2018-01-18 2018. Grimsgaard, Sameline. The Tromsø study for Arcic Frontiers student forum. Arctic Frontiers 2018-01-19 - 2018-01-19 2018. Grimsgaard, Sameline. Tromsøundersøkelsen - nasjonalt folkehelsebarometer. Innspillsmøte til Folkehelsemeldingen 2018-04-05 - 2018-04-05 2018. Grimsgaard, Sameline. Tromsøundersøkelsen. Møte i Rotary Tromsø 2018-04-05 - 2018-04-05 2018. Strøm, Henriette Kyrrestad; Grimsgaard, Sameline. Tromsøundersøkelsens barn - Barnestudien. Program for folkehelsearbeid i kommunene 2018-01-10 - 2018-01-10 2018. Aamdal, Steinar; Bentzen, Heidi Beate; Borge, Ole Johan; Erikstein, Bjørn K; Grimsgaard, Sameline; Hovig, Johannes Eivind; Myklebost, Ola; Widerberg, Ketil. Åpne Nordens grenser for forskning og behandling. (fulltekst) Aftenposten (morgenutg. : trykt utg.) 2017. ISSN 0804-3116. Grimsgaard, Sameline. Improving public health - the Tromsø study. Meeting with delegation from Northwest Russia 2017-05-09 - 2017-05-09 2017. Grimsgaard, Sameline. "Heart to heart"-project and the Tromsø 7 study. International Project on CVD in Russia - workshop presentation 2017-04-27 - 2017-04-27 2017. Grimsgaard, Sameline. NCD-indikatorer - preliminære data fra Tromsøundersøkelsen. Møte i nasjonal samarbeidsgruppe for ikke-smittsomme sykdommer 2017-01-30 - 2017-01-30 2017. Grimsgaard, Sameline; Johansen, Heidi. Tromsøundersøkelsen - nyttig for Tromsø kommune?. Møte med Helse og Omsorgskomiteen Tromsø kommune 2017-05-10 - 2017-05-10 2017. Grimsgaard, Sameline. Tromsøundersøkelsen. Eldrerådskonferansen Troms Fylkeskommune 2017-09-06 - 2017-09-06 2017. Grimsgaard, Sameline. Tromsøundersøkelsen for Rotary inner wheel. Møte i Rotary inner wheel (kvinnergruppen) 2017-10-18 - 2017-10-18 2017. Grimsgaard, Sameline. Tromsøundersøkelsen - en gullgruve for medisinsk forskning. Indermedisinsk høstmøte 2017-10-19 - 2017-10-19 2017. Grimsgaard, Sameline. The Tromsø study - for visiting politicians from Netherland. Lecture for visiting politicians from Netherland 2017-11-21 - 2017-11-21 2017. Grimsgaard, Sameline; Johansen, Heidi. Tromsøundersøkelsen - nasjonalt folkehelsebarometer. Møte med Tromsøbenken (politikere) 2017-11-24 - 2017-11-24 2017. Aars, Nils Abel; Jacobsen, Bjarne K.; Furberg, Anne-Sofie; Nielsen, Christopher Sivert; Grimsgaard, Sameline. Physical Activity and Body Composition; Cross Sectional Results from the Tromsø Study - Fit Futures Cohort 2010-11.. Norsk forening for epidemiologi: NOFE conference 2017 2017-11-07 - 2017-11-08 2017. Grimsgaard, Sameline. Hvordan står det til med Tromsøværingen?. Lørdagsuniversitetet 2017-03-04 - 2017-03-04 2017. Lundblad, Marie Wasmuth; Andersen, Lene Frost; Jacobsen, Bjarne K.; Carlsen, Monica Hauger; Hjartåker, Anette; Grimsgaard, Sameline; Hopstock, Laila Arnesdatter. Nutrient intake in the 7th survey of the Tromsø Study 2015-16, and comparison with Norwegian national dietary recommendations. Norsk forening for epidemologi (NOFE conference) 2017-11-07 - 2017-11-08 2017. Lundblad, Marie Wasmuth; Andersen, Lene Frost; Jacobsen, Bjarne K.; Carlsen, Monica Hauger; Hjartåker, Anette; Grimsgaard, Sameline; Hopstock, Laila Arnesdatter. Nutrient intake in the 7th survey of the Tromsø Study 2015-16, and comparison with Norwegian national dietary recommendations. Norsk Epidemiologi, Supplement 2017. ISSN 0803-4206. Morseth, Bente; Jacobsen, Bjarne K.; Emaus, Nina; Hopstock, Laila Arnesdatter; Jørgensen, Lone; Grimsgaard, Sameline; Nordström, Anna; Wilsgaard, Tom; Deraas, Trygve Sigvart. Secular trends in physical activity among adults and elderly. The Tromsø Study 1979-2016. ISBNPA Annual Meeting 2017-06-07 - 2017-06-10 2017. Grimsgaard, Sameline. Tromsøundersøkelsen - forskningsgull og folkehelsebarometer. Møte med politikere: Nord-Norge-benken 2016-11-21 - 2016-11-21 2016. Grimsgaard, Sameline. Regionale undersøkelsen i Troms: oppfyllelse av Folkehelseloven. Folkehelseseminar 2016-11-02 - 2016-11-02 2016. Johansen, Dag; Grimsgaard, Sameline. Kan "Big Data" brukes til forskning på helse og sykdom?. (data) 2014. Ritenbaugh, Cheryl; Aickin, Mikel; Bradley, Ryan; Caspi, Opher; Grimsgaard, Sameline; Musial, Frauke. Whole Systems Research Becomes Real: New Results and Next Steps. Journal of Alternative and Complementary Medicine 2010; Volum 16 (1). ISSN 1075-5535.s 131 - 137.s doi: 10.1089/acm.2009.0650. Borud, Einar Kristian; Grimsgaard, Sameline. Acupuncture treatment for postmenopausal hot flashes. 2010 ISBN 978-82-92672-05-1. Borud, Einar Kristian; Alræk, Terje; Grimsgaard, Sameline. TRADITIONAL CHINESE MEDICINE ACUPUNCTURE IMPROVES HEALTH RELATED QUALITY OF LIFE IN POSTMENOPAUSAL WOMEN: THE ACUFLASH STUDY,A PRAGMATIC RANDOMIZED CONTROLLED CLINICAL TRIAL. The Third International Congress on Complementary Medicine Research, 2008 2008-03-28 - 2008.